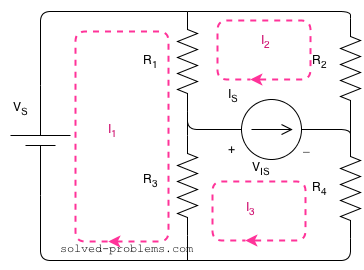 A mesh current is the current passing through elements which are not shared by other loops. This is to say that for example the current of the voltage source is , the current of is and so on. But how about elements shared between two meshes? Current of such elements is the algebraic sum of both meshes. For example if we assume the current of is defined with direction from top to bottom, its current would be . If one assume the inverse direction, i.e. from bottom to top, it would be . 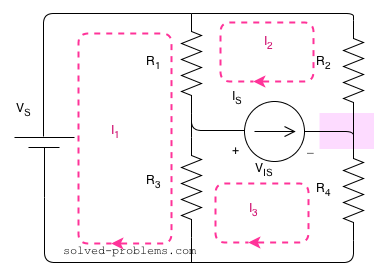 Assign a voltage to the current source ( ). 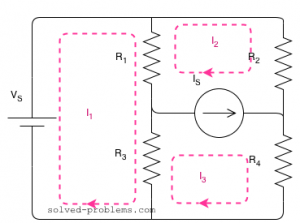 Write equations using and later add equations of Mesh II and III to get rid of . Write the equation for the Supermesh II & III. A supermesh is a larger loop which has both meshes inside. Note that for , unlike the equation for Mesh I, the current is . This is because we are walking around the loop with the direction of , or briefly it is because we are writing the equation for mesh of . As you can see, we were able to write the equation in one shot. 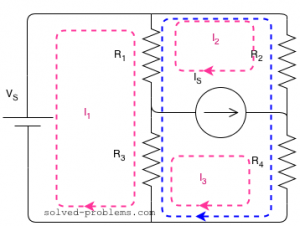 That is why the supermesh method is preferred. Now, we have two equations: one for Mesh I and one for the supermesh. But there are three unknowns: , and . So we need another equation. 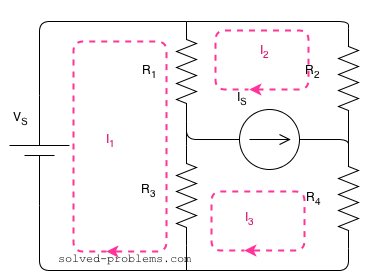 The third equation comes from the current source by writing KCL one of its nodes. We choose the node which is not shared by third loop which is the loop at the right hand side for this example. This way we minimize the number of terms in the equation. Note that the current of and are and , respectively, but the terms for and are more complicated because of involvement. Let's apply KCL for the right hand side node. and are entering to the node and is leaving. 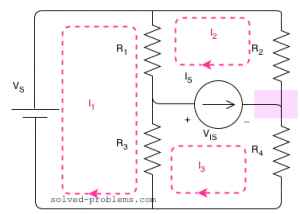 The circuit is solved. 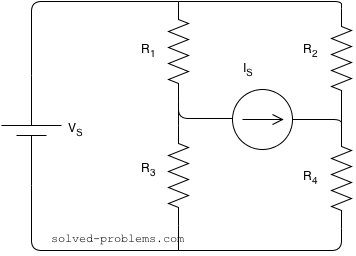 Any other voltage or current in the circuit can be easily found using mesh currents. To find power of sources, we need current of the voltage source and voltage across the current source. (supplying power). Take a look here if you are would like to know how power of independent sources should be calculated. (supplying power). 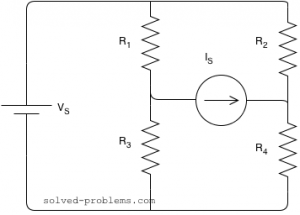 Now, it is on you to find the power of all resistors and validate that the power conservation law is satisfied. If you ever get the questions please send me too. We do not need to confirm it. We assume a path and after solving we get the numeric value which can be negative, which is fine.